In this section you will find all the useful information and details you need to complement our range of calendars. 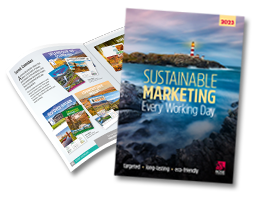 Find out what upgrade options are available to make your promotional calendars even more effective. Consider bespoke calendars if you wish to go a little further with your personalisation, matching to brand colours or including your logo on a personalised cover for instance. Find out which of our calendar materials are recycled or sourced from sustainable sources. There is also some useful information on calendar recycling and how you can recycle the materials in our calendars. You can view a brochure and see the full range of calendars we offer, sharing them with colleagues if you wish. Click on the titles above to find out more about each subject.